Background: Control of blood sugar, hypertension, and dyslipidemia are key factors in diabetes management. Cucurbita ficifolia (pumpkin) is a vegetable which has been used traditionally as a remedy for diabetes in Iran. In addition, consumption of probiotics may have beneficial effects on people with Type 2 diabetes. The aim of this study was an investigation of the effects of C. ficifolia and probiotic yogurt consumption alone or at the same time on blood glucose and serum lipids in diabetic patients. Methods: Eighty eligible participants randomly were assigned to four groups: 1 - green C. ficifolia (100 g); 2 - probiotic yogurt (150 g); 3 - C. ficifolia plus probiotic yogurt (100 g C. ficifolia plus 150 g yogurt); and 4 -control (dietary advice) for 8 weeks. Blood pressure, glycemic response, lipid profile, and high-sensitive C-reactive protein (hsCRP) were measured before and after the intervention. Results: Total cholesterol (TC) decreased significantly in yogurt and yogurt plus C. ficifolia groups (within groups P = 0.010, and P < 0.001, respectively). C. ficifolia plus yogurt consumption resulted in a decrease in triglyceride (TG) and an increase in high-density lipoprotein cholesterol (HDL-C) (within groups P < 0.001 and P = 0.001, respectively). All interventions led to a significant decrease in blood sugar, hemoglobin A1c (HbA1c), hsCRP, and low-density lipoprotein cholesterol (LDL-C) level within groups. Blood pressure decreased significantly in Cucurbita group and yogurt group (within groups P < 0.001, and P = 0.001 for systolic blood pressure [SBP] and P < 0.001, and P = 0.004 for diastolic blood pressure [DBP], respectively). All variables changed between groups significantly except LDL-C level. Conclusions: Variables including TG, HDL-C, TC, fasting blood sugar, HbA1c, SBP, DBP, and hsCRP changed beneficially between groups. It seems that consumption of C. ficifolia and probiotic yogurt may help treatment of diabetic patients. Since, there is little information regarding the effects of C. ficifolia and probiotic foods on blood glucose levels in humans, the goal of this study was to determine the effects of C. ficifolia and/or probiotic yogurt consumption on glycemic control, lipid profile, and inflammatory markers in Type 2 diabetic patients. We conducted a parallel-group randomized controlled clinical trial. Type 2 diabetic patients were recruited from the Endocrinology and Metabolism Research Center, Isfahan. Eligibility criteria were age between 25 and 75 years, fasting blood sugar (FBS) more than 126 mg/dL, and controlled blood lipid without changing the drug instruction. All participants had to be no-smokers, take metformin or glibenclamide to control blood sugar, and not to drink any kinds of alcoholic beverages. Patients were excluded if they had a history of chronic illnesses such as renal, liver, pulmonary, and heart diseases or pancreatitis, endocarditis, short bowel syndrome, and allergy. None of the participants had autoimmune disorders were pregnant or lactating mothers. Totally, 80 Type 2 diabetic patients were selected and asked to participate in the study. The study protocol was approved by the Ethics Committee at Isfahan University of Medical Sciences, and all participants completed an informed consent form. Flow chart of study participants was shown in [Figure 1]. After enrollment, the subjects were randomly assigned to one of four dietary intervention arms lasting 8 weeks. During the intervention, subjects took one of following diets: (1) C. ficifolia (100 g); (2) probiotic yogurt (150 g); (3) C. ficifolia and probiotic yogurt (100 g C. ficifolia plus 150 g yogurt); and (4) control (dietary advice). Patients were instructed on consuming C. ficifolia and yogurt at lunch. They were required to consume C. ficifolia. Subjects were asked not to change their dietary habits, physical activity level, or other lifestyle factors during the study. Dietary compliance was assessed by regular weekly contacts or text messages. We also took a 3-day diet recall to assure compliance and analyzed it with Nutrition-IV software, version 15 (First Databank, San Bruno, CA, USA). This clinical trial was registered at irct.ir with number IRCT2013041311763N7. Five milliliter of fasting blood samples were obtained at baseline and at the end of the study. Plasma and serum stored at −70°C for determination of glucose, lipids, and CRP. Total cholesterol (TC), high-density lipoprotein cholesterol (HDL-C), and triacylglycerols were measured by autoanalyzer. The Friedewald equation was used to calculate low-density lipoprotein cholesterol (LDL-C),  when plasma triglyceride (TG) concentration was <400 mg/dL. Blood glucose (glucose oxidase method)  and hemoglobin A1c (HbA1c) were determined by an autoanalyzer. Serum concentrations of high sensitive C-reactive protein (hsCRP) were determined by immune turbidimetric using PARS AZMOON kit. All quantitative variables have been reported as mean ± standard deviation, and qualitative variables as frequency (percent). Normality of variables was evaluated using K-S test or P-P plot. For nonnormal variables, log transformation was used. One-way analysis of variance (ANOVA) and Chi-square were used to assess baseline differences among the groups. Paired t-test was used to evaluate the difference between baseline and final values. Further analyses were conducted to investigate the between-group comparisons using multivariate ANOVA or multivariate analysis of covariance as appropriate. Bonferroni post hoc test was used for pairwise comparisons. The value P < 0.05 was considered as statistically significant level. Analyses were performed using SPSS 15.0 (SPSS Inc., Chicago, IL, USA). All 80 subjects completed the study (28.4 ± 2.9 y; body mass index, 23.1 ± 0.9 kg/m 2 ). The characteristics of the patients showed no significant differences between groups [Table 1]. There was no significant difference between groups in total energy intake, macronutrient intake, and body weight at baseline. At the end of the study, no statistically significant differences between groups were observed for dietary intakes [Table 2]. Baseline values of biochemical measures were not different between groups. After 8 weeks, there were no significant changes in TC and LDL-C in the control group, but TG increased (P = 0.012), and HDL-C decreased (P = 0.034) significantly. In all intervention groups TC decreased, but it was significant only in yogurt and yogurt plus C. ficifolia groups (P = 0.010, and P < 0.001, respectively). TG declined, and HDL-C enhanced significantly in C. ficifolia plus yogurt group (P < 0.001and P = 0.001, respectively). Yogurt consumption decreased LDL-C significantly (P = 0.003 in yogurt and P = 0.004 in C. ficifolia plus yogurt). All changes were significant between groups (P < 0.001) except for LDL-C.
All interventions significantly decreased FBS (P = 0.001 in pumpkin, P = 0.014 in yogurt, and P < 0.001in C. ficifolia plus yogurt) and HbA1c (P < 0.001in C. ficifolia, P = 0.002 in yogurt, and P = 0.000 in C. ficifolia plus yogurt) in comparison with control group (between group P, 0.001 and < 0.001, respectively). HsCRP showed a significant reduction in all intervention groups (P < 0.001) which was more significant in C. ficifolia and C. ficifolia plus yogurt groups compared with yogurt group. At the end of the study, a statistically significant difference was seen among groups in systolic blood pressure (SBP) and diastolic blood pressure (DBP). 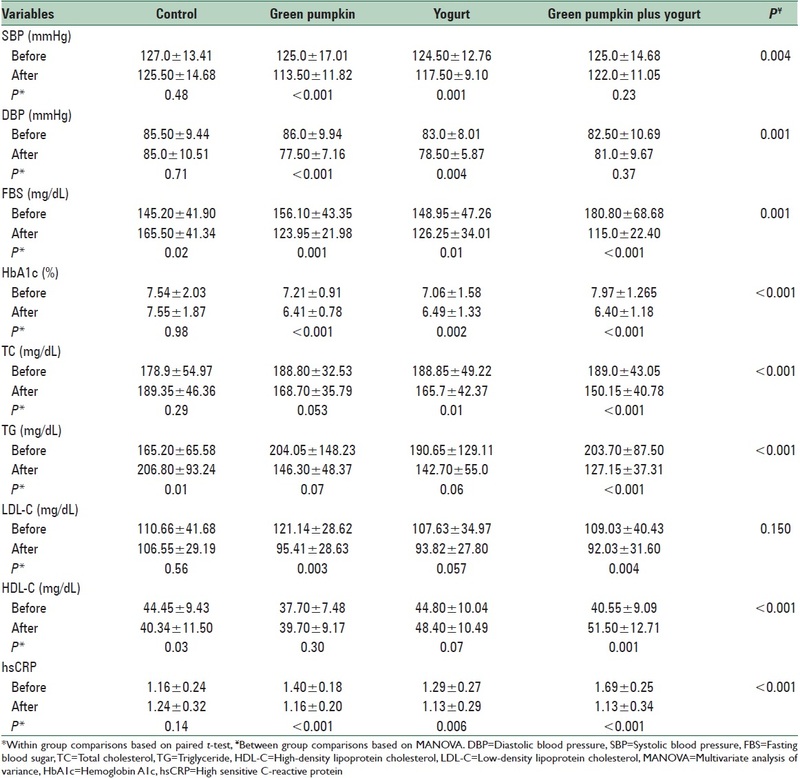 Blood pressure decreased in C. ficifolia group and yogurt group significantly (P < 0.001, and P = 0.001 for SBP and P < 0.001, and P = 0.004 for DBP, respectively) [Table 3]. In patients with Type 2 diabetes, it appears that probiotic yogurt consumption may substantially influence TC, FBS, HbA1c, hsCRP, and blood pressure. C. ficifolia significantly decreased LDL-C, glycemic control, hsCRP, and blood pressure. The most favorable effects on lipid profile, FBS, HbA1c, and hsCRP were related to C. ficifolia plus probiotic yogurt. In this study, yogurt and C. ficifolia intake relative to their combination reduced SBP and DBP. Agerholm-Larsen et al. showed that 8 weeks intake of probiotic milk products decreased SBP significantly in healthy obese and overweight people. Daily ingestion of the probiotic dairy such as fermented milk can reduce blood pressure in the high normal to mild hypertensive subjects. Probiotics produce angiotensin-converting enzyme peptides by microbial activity which can play a role in blood pressure reduction. It has not yet been defined any special mechanism for blood pressure lowering effect of C. ficifolia. As oxidative stress can lead to an increase in peripheral vascular resistance and hypertension  and Cucurbita decreases lipid peroxidation index such as thiobarbituric acid reactive substances and malondialdehyde and increases glutathione activity, , this outcome can be partly explained. However, we could find no interpretation for the lack of impact of yogurt and C. ficifolia combination on blood pressure. Our results suggest that probiotic yogurt and C. ficifolia alone or together have beneficial effects on lipid profile, glycemic control, inflammation, and blood pressure in Type 2 diabetic patients. Our data confirm that concomitant use of C. ficifolia and yogurt has more noteworthy results in comparison with their intake alone. Variables including TG, HDL-C, TC, FBS, HbA1c, SBP, DBP, and hsCRP changed beneficially between groups. It seems that consumption of C. ficifolia and probiotic yogurt may help treatment of diabetic patients. Conducting more research in this area seems necessary to elucidate mechanisms and other effects. We thank Isfahan University of medical sciences and Food Security Research Center, Isfahan University of Medical Sciences (Study project number: 392362). Kiencke S, Handschin R, von Dahlen R, Muser J, Brunner-Larocca HP, Schumann J, et al. Pre-clinical diabetic cardiomyopathy: Prevalence, screening, and outcome. Eur J Heart Fail 2010;12:951-7. Shaw JE, Sicree RA, Zimmet PZ. Global estimates of the prevalence of diabetes for 2010 and 2030. Diabetes Res Clin Pract 2010;87:4-14. Esteghamati A, Meysamie A, Khalilzadeh O, Rashidi A, Haghazali M, Asgari F, et al. Third national Surveillance of Risk Factors of Non-Communicable Diseases (SuRFNCD-2007) in Iran: Methods and results on prevalence of diabetes, hypertension, obesity, central obesity, and dyslipidemia. BMC Public Health 2009;9:167. Lutale J, Thordarson H, Sanyiwa A, Mafwiri M, Vetvik K, Krohn J. Diabetic retinopathy prevalence and its association with microalbuminuria and other risk factors in patients with type 1 and type 2 diabetes in Dar es Salaam, Tanzania. JOECSA 2013;15:263-7. Suksomboon N, Poolsup N, Boonkaew S, Suthisisang CC. Meta-analysis of the effect of herbal supplement on glycemic control in type 2 diabetes. J Ethnopharmacol 2011;137:1328-33. Rao MU, Sreenivasulu M, Chengaiah B, Reddy KJ, Chetty CM. Herbal medicines for diabetes mellitus: A review. Int J PharmTech Res 2010;2:1883-92. Quanhong L, Caili F, Yukui R, Guanghui H, Tongyi C. Effects of protein-bound polysaccharide isolated from pumpkin on insulin in diabetic rats. Plant Foods Hum Nutr 2005;60:13-6. Mani-López E, Palou E, López-Malo A. Probiotic viability and storage stability of yogurts and fermented milks prepared with several mixtures of lactic acid bacteria. J Dairy Sci 2014;97:2578-90. Nabavi S, Rafraf M, Somi MH, Homayouni-Rad A, Asghari-Jafarabadi M. Effects of probiotic yogurt consumption on metabolic factors in individuals with nonalcoholic fatty liver disease. J Dairy Sci 2014;97:7386-93. Cruz AG, Castro WF, Faria JA, Lollo PC, Amaya-Farfán J, Freitas MQ, et al. Probiotic yogurts manufactured with increased glucose oxidase levels: Postacidification, proteolytic patterns, survival of probiotic microorganisms, production of organic acid and aroma compounds. J Dairy Sci 2012;95:2261-9. Lollo PC, Morato PN, Moura CS, Almada CN, Felicio TL, Esmerino EA, et al. Hypertension parameters are attenuated by the continuous consumption of probiotic Minas cheese. Food Res Int 2015;76:611-7. Kadish AH, Litle RL, Sternberg JC. A new and rapid method for the determination of glucose by measurement of rate of oxygen consumption. Clin Chem 1968;14:116-31. Mazloom Z, Yousefinejad A, Dabbaghmanesh MH. Effect of probiotics on lipid profile, glycemic control, insulin action, oxidative stress, and inflammatory markers in patients with type 2 diabetes: A clinical trial. Iran J Med Sci 2013;38:38-43. Ataei-Jafari A, Tahbaz F, Alavi-Majd H, Joodaki H. Comparison of the effect of a probiotic yogurt and ordinary yogurt on serum cholesterol levels in subjects with mild to moderate hypercholesterolemia. Iran J Diabetes Lipid Disord 2005;4:48-3. Moroti C, Magri LF, de Rezende Costa M, Cavallini DC, Sivieri K. Effect of the consumption of a new symbiotic shake on glycemia and cholesterol levels in elderly people with type 2 diabetes mellitus. Lipids Health Dis 2012;11:1-8. Díaz-Flores M, Angeles-Mejia S, Baiza-Gutman LA, Medina-Navarro R, Hernández-Saavedra D, Ortega-Camarillo C, et al. Effect of an aqueous extract of Cucurbita ficifolia Bouché on the glutathione redox cycle in mice with STZ-induced diabetes. J Ethnopharmacol 2012;144:101-8. Kazemi S, Asgari S, Mshtaqyan S, Rafieian M, Mahzouni P. Pumpkin preventive effect on diabetic indices and histopathology of the pancreas in rats with alloxan diabetes. J Isfahan Med Sch 2010;28:1108-117. Yoshinari O, Sato H, Igarashi K. Anti-diabetic effects of pumpkin and its components, trigonelline and nicotinic acid, on Goto-Kakizaki rats. Biosci Biotechnol Biochem 2009;73:1033-41. Aggarwal J, Swami G, Kumar M. Probiotics and their effects on metabolic diseases: An update. J Clin Diagn Res 2013;7:173-7. Moroti C, Souza Magri LF, de Rezende Costa M, Cavallini DC, Sivieri K. Effect of the consumption of a new symbiotic shake on glycemia and cholesterol levels in elderly people with type 2 diabetes mellitus. Lipids Health Dis 2012;11:29. Acosta-Patiño JL, Jiménez-Balderas E, Juárez-Oropeza MA, Díaz-Zagoya JC. Hypoglycemic action of Cucurbita ficifolia on type 2 diabetic patients with moderately high blood glucose levels. J Ethnopharmacol 2001;77:99-101. Alarcon-Aguilar FJ, Hernandez-Galicia E, Campos-Sepulveda AE, Xolalpa-Molina S, Rivas-Vilchis JF, Vazquez-Carrillo LI, et al. Evaluation of the hypoglycemic effect of Cucurbita ficifolia Bouché (Cucurbitaceae) in different experimental models. J Ethnopharmacol 2002;82:185-9. Jiang Z, Du Q. Glucose-lowering activity of novel tetrasaccharide glyceroglycolipids from the fruits of Cucurbita moschata. Bioorg Med Chem Lett 2011;21:1001-3. Xia T, Wang Q. Hypoglycaemic role of Cucurbita ficifolia (Cucurbitaceae) fruit extract in streptozotocin-induced diabetic rats. J Sci Food Agric 2007;87:1753-7. Yadav M, Jain S, Tomar R, Prasad GB, Yadav H. Medicinal and biological potential of pumpkin: An updated review. Nutr Res Rev 2010;23:184-90. Kazemi S, Asgari S, Mshtaqyan S, Rafieian M, Shklabady R. Pumpkin preventive effect on serum lipid levels in alloxan-induced diabetic mice. Univ J Med Sci 2011;9:1108-17. Hadisaputro S, Djokomoeljanto RR, Judiono, Soesatyo MH. The effects of oral plain kefir supplementation on proinflammatory cytokine properties of the hyperglycemia Wistar rats induced by streptozotocin. Acta Med Indones 2012;44:100-4. Jeppsson B, Mangell P, Thorlacius H. Use of probiotics as prophylaxis for postoperative infections. Nutrients 2011;3:604-12. Isolauri E, Kirjavainen PV, Salminen S. Probiotics: A role in the treatment of intestinal infection and inflammation? Gut 2002;50 Suppl 3:III54-9. Agerholm-Larsen L, Raben A, Haulrik N, Hansen AS, Manders M, Astrup A. HYPERLINK "http://www.ncbi.nlm.nih.gov/pubmed/10745279". Effect of 8 week intake of probiotic milk products on risk factors for cardiovascular diseases. Eur J Clin Nutr 2000;54:288-97. Lye HS, Kuan CY, Ewe JA, Fung WY, Liong MT. The improvement of hypertension by probiotics: Effects on cholesterol, diabetes, renin, and phytoestrogens. Int J Molec Sc 2009;10:3755-75. Gobbetti M, Ferranti P, Smacchi E, Goffredi F, Addeo F. Production of Angiotensin-I-converting-enzyme-inhibitory peptides in fermented milks started by Lactobacillus delbrueckiisubsp. bulgaricus SS1 and Lactococcus lactissubsp. cremoris FT4. APPL ENVIRON MICROB 2000;66:3898-904. Taniyama Y, Griendling KK. Reactive oxygen species in the vasculature molecular and cellular mechanisms. Hypertension 2003;42:1075-81.